Interstate 10 (I-10) is the major east–west Interstate Highway in the Southern United States. In the U.S. state of Texas, it runs east from Anthony, at the border with New Mexico, through El Paso, San Antonio and Houston to the border with Louisiana in Orange, Texas. 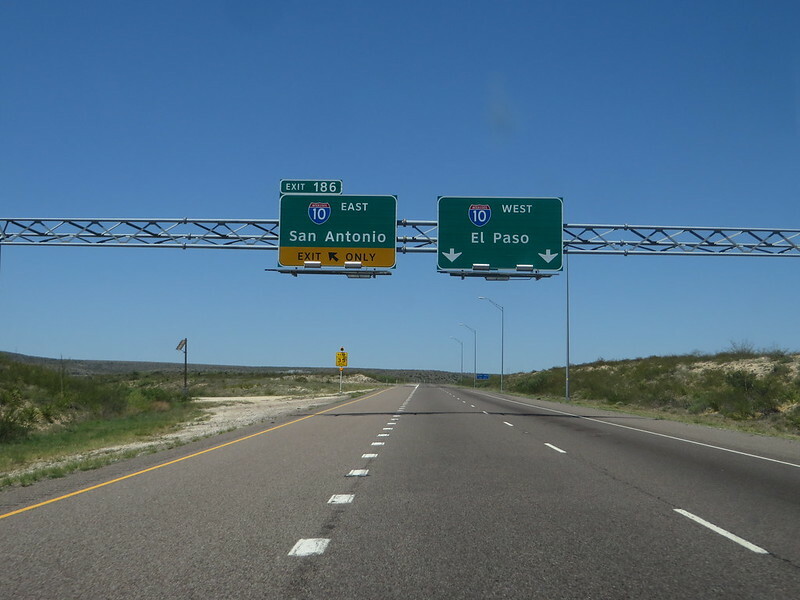 At just under 879 miles (1,415 km), the stretch of Interstate 10 crossing Texas, maintained by the Texas Department of Transportation, is the longest continuous untolled freeway under a single authority in North America, a title formerly held by Ontario’s Highway 401. Mile marker 880 (and the corresponding exit number) near Orange are the highest numbered mile marker and exit on the Interstate Highway System or, for that matter, on any freeway in North America. Texas alone contains more than a third of the interstate’s entire length. El Paso, near the Texas-New Mexico state line, is 785 miles (1,263 km) from the western terminus of I-10 in Santa Monica, California, making it closer to Los Angeles than it is to Orange, Texas, 857 miles (1,379 km) away. Likewise, Orange, on the Texas–Louisiana state line, is only 789 miles (1,270 km) from the eastern terminus of I-10 in Jacksonville, Florida. I-10 is the busiest freeway in San Antonio with nearly 200,000 vehicles on an average day. On the northwest side, I-10 is known as the McDermott Freeway, named after Robert F. McDermott, former dean of the United States Air Force Academy as well as CEO of San Antonio-based USAA. The highway enters the city concurrently with US 87 from the north and travels more in a north–south direction into downtown, rather than the east–west designation found on the Interstate Highway signs. The northern section from Loop 1604 to downtown serves one of the fastest growing areas of the city. A majority of the region’s suburban office space is located along the corridor as are the headquarters for USAA, gasoline refiner and retailer Valero, South Texas Medical Center, the University of Texas at San Antonio (UTSA), Six Flags Fiesta Texas, and the Shops at La Cantera. I-10 intersects I-410 for the first time near Balcones Heights, a suburban city within San Antonio. The construction of a four-level interchange to accommodate the growing northwest side has been completed. Heavy commercial development dominates the landscape between I-410 and Loop 1604. Inside I-410, the route is lined with light industrial and residential areas. As I-10 heads south into downtown, it splits into an upper level with three lanes in each direction and a lower level with two lanes in each direction. It was necessary to design the freeway this way in order to accommodate the amount of traffic heading into downtown and to fit into the narrow corridor that was surrounded by existing infrastructure. I-10 meets I-35 on the northwest side of downtown and it overlaps I-35 south to form the west side of the downtown loop. The I-35 exit numbers are carried through during the concurrency. I-10 and I-35 end their concurrency at a four-level interchange on the southwest side of downtown with the junction of US 90 from the west. I-35 continues to the south and I-10 and US 90 run concurrently to the east to form the south side of the downtown loop. This section of I-10 is known as the Jose Lopez Freeway, named after the Medal of Honor recipient. A four-level interchange with I-37 occurs approximately two miles (3.2 km) east of the I-35 interchange. I-10 heads east away from downtown through mainly residential neighborhoods on the east side of San Antonio. I-10’s concurrency with US 87 ends just east of downtown where US 87 heads south towards Victoria. I-10 provides access to the AT&T Center, home of the San Antonio Spurs, and to the Freeman Coliseum. Leaving San Antonio, I-10 again passes I-410 and Loop 1604. I-10 is known as the 90th Infantry Division Memorial Highway on this stretch east of San Antonio. I-10 and US 90 continue their concurrency until they diverge in Seguin. They continue from there on to Houston nearly paralleling each other with short stints of overlaps along the route. Image published by Ken Lund on 2016-07-11 08:40:29 and used under Creative Commons license.